This item is presumed to be in the public domain under the copyright legislation of the Philippines. The Library at SOAS University of London respects the intellectual property rights of others and do not claim any copyright interest in this item. Users of this work have responsibility for determining copyright status prior to reusing, publishing or reproducing this item for purposes other than what is allowed by fair use or other copyright exemptions. Any reuse of this item in excess of fair use or other copyright exemptions may require permission of the copyright holder.
' >/" i >: *'' -	' . .
being added to the roots of words. but the infixes and suffixes are few. and RGH3 laws in Philippine languages. 1	Lecture delivered in the Villamor Hall, October 12, 1939.
we have not come across any study on these affixes. thors we have named in the introduction. formed beginning with consonants, e. g., ba, ka, da, etc. is smaller than that indicated by the root. infix is the same as that of the first syllable of the root. small broom or an object like a broom, silhig broom). that ro is the generally used infix in this language. the same vowel as that of the first syllable of the root. fixes la, li, lo may be either augmentative or diminutive. infix takes the vowel o.
Sebu: nagatolotindog standing a little (tindog stand). We devide (things) among ourselves. Those who were fighting were arrested. If the fishes are small, give the people by piece. (1)	Ik kitu na ay dakal. (2)	Darakal ngamin ik kitu. (They) Maria, Jose and Juan exchange pencils. Let us take a bath after we finish our work. agents of actions or occupations. sinan, Pampangan and Ibanag languages save Frank R.
cognized the existence of the infixes la, li, lo. Recently, Mr.
finding al as their equivalent. with the finger, with infixed io. stances traces of a diminutive meaning are apparent. that al is the correct form in Tagalog of the infixes la, li, lo. one of the shoulders, sabat to die. root and not in an affix. being that most of his examples are not Tagalog. relation with his supposed roots. ag, and ay forms all exist. other forms of the infix al. pang cut nails off finger or toes, or hair). similar or practically the same meaning as that of the root. present which are but few in all the languages studied. the difficulty of determining whether al or la is used arises. we have already indicated provides a good test. 1. Agudo, Hortensia, Preliminary Study of the Affixes in Ibanag. Institute of National Language. Manila. Typewritten. 2. Balmaseda, Julian C., Ang tipik na al sa wikang Tagalog. mitted to the Balagtasiana. Manila. Typewritten. 3. Bergano, Diego, Arte de la lengua pampanga. Tercera edicion. Loreto de el pueblo de Sampaloc, ano 1736. Manila. Tip. del Colegio de Santo Tomas. 1916.
mance. Compuesto por el M. R. P. lector Fr. Diego Bergano. 2a ed. Reimpreso: Manila. Impr. de Ramirez y Giraudier. bong Pequena. Tipo.-lit. del asilo de huerfanos. 1894.
chief native idiom of the Philippine Islands, by Frank R.
Blake. . New Haven, Conn. American Oriental Society. Rodriguez. Manila. Imp. Amigos del Pais. 1854. 8. Calderon, Sofronio G., Diccionario ingles-espanol-tagalog. M. R. P. Predicador Fr. Andres Carro. 2a ed. Manila. Est. tip.-lit. de M. Perez, hijo. 1888. Colegio de Santo Tomas a cargo de G. Memije. 1878. 11. Desmond, Henry, Elements oj Tagalog Grammar. Manila. Catholic Trade School. Copyright 1929.
provincia. Se publica con la autorizacion de N. M. R. P.
Encina, reformada por el m. r. p. fr. Nicolas Gonzales de S.
Vicente Ferrer. Manila. Imp. de Amigos del Pais. 1885. Provincial y Foraneo, Fr. Pedro Villanova. Manila. Est. tip. del Colegio de Santo Tomas, a cargo de B. Salo. 1865. 16. Figueroa, Antonio, Arte del idioma Visaya de Samar y Leyte. 2a ed. Binondo. Impr. de B. Gonzales Morer. 1872.
stitute of National Language. Manila. Typewritten. dialecto bisaya-cebuano; escrita por el r. p. fr. Felix Guillen. Malabon, Estab. tipo. lit. del Asilo de huerfanos. 1898.
del exmo. ilmo. sr. dr. d. fr. Francisco Ganiza. Manila. Est. tip. del Colegio de Santo Tomas. 1865.
lications of the Institute of National Language. Manila. Bureau of Printing. Vol. II, November, 1937.
yana, por Raimundo Lozano. Valladolid. L. N. de Gaviria. corregido y aumentado y llevando en si mismo el compendio. Manila, I. F. Imp. del Colegio de Sto. Tomas. 1904.
las provincias de Samar y Leyte, compuesto por el r. p. Fr. gunda parte. Manila. Impr. y lit. de Santos y Bernal. 1914.
tagalog. Manila. J. Fajardo. 1929.
todo de Ollendorff. Manila. Impr. de Santos y Bernal. 33. Vilches, Manuel, Gramdtica Visaya-Cebuana. Manila. Impr. de Ramirez y Giraudier. 1897. Pangasinan. Institute of National Language. Manila. 36. Wolfenson, Louis B., The Infixes la, li, lo in Tagalog. 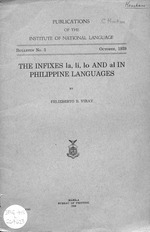 1906, v. 27, p. 142-146.
directly or indirectly, with problems in Philippine linguistics. the contents of the contributions accepted for publication. Alumni Building, Padre Faura, Florida. the authors upon sending sufficient amount to cover postage.
! !"!"!!!!"!!!" !!!"#!$%&$!" !"!!!'!! (!"!)*+*,-. "!"!!!$"!" !!"#$! ""%&% '%( #))!#""!) #%! "&* "")) #&%!" #%$!" % # +#!)%#!#""& ! "!,)!#"") !,)!#"") % #)%#%#!" !% +%##"") '(! '(%) % !'-(&! #%!. !&"* "" ""!&)!")"!#!!! /")#)# %0'(##) )"),'(+#")""")) ""!&"$! !! "# $!! "%&'# %()*")')+#,"+# -"%. "/%"/%# +# #,"01)2)3#443567#87. (%9 !"#$!!"!""!"""! "%!"""!"&'"
! "# !$ % %&'( )*+,-.' !!! / *0+-&+*1$' !2! 03 +1*+ %,% ,".. (4(*&)($ !52 6! -77)$*89 !!" ## !52 :+7((-+*1;* !5" 5$% ,;;$ !2, 2 !$&&&' 7):1<= ! "$&&&'$< 7):1= %#!7 &.&>7?$&-&7 !%!